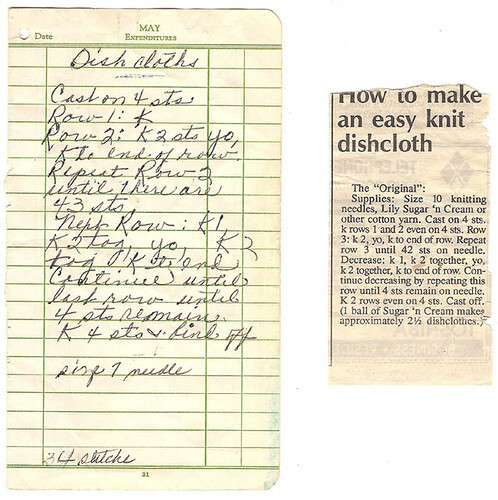 The subject of how cool it is to find notes and handwriting in old books came up today on facebook, so I thought I would share with you the notes my grandma Lillian (1926-2009) made for a pattern for a simple dishcloth. She would often copy tips and patterns from magazines borrowed from friends in order to be able to have a copy. Most tips and short patterns were copied in to the margins or backs of scrap papers- the backside of sales sheets for farm equipment or even receipts. This note is unusual, since there usually is not the actual pattern with the note (though this may not be the same exact pattern in the note versus the clipping- the row numbers and stitch count to increase to are different 42 and 43). You'll also notice that she made a note to use smaller needles and increase to fewer stitches.